Ashley Holzer of Toronto, ON, will advance to the next round of individual competition in dressage at the 2012 London Olympic Games. Competing as a member of the Canadian Olympic Team for Dressage, Holzer earned a score of 71.809% riding Breaking Dawn in the Grand Prix test on Friday, August 3. The top seven nations, as well as the top 11 individuals not already included as members of the top seven teams, advance to the Grand Prix Special to be held on Tuesday, August 7. At the conclusion of the Grand Prix Special, team medals will be awarded. The top 18 individual competitors will then contest the individual medals in the Grand Prix Freestyle to music on Thursday, August 9. 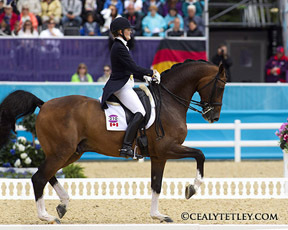 The individual medals in Dressage will be the final equestrian sport medals to be awarded at the 2012 London Olympics. Holzer’s score of 71.809% ranked her 20th among the 50 athletes competing in the equestrian sport of Dressage at the 2012 Olympic Games, and easily qualified her for the Grand Prix Special. London marks the fourth Olympic appearance for Holzer, who was a member of Canada’s bronze medal team at the 1988 Seoul Olympics. “I can’t say enough about the horse,” said Holzer of Breaking Dawn, owned by herself and P.J. Rizvi. “This horse has not even competed at the Grand Prix level for a year yet. In his test today, he kept on getting better. It’s amazing. I’m thrilled. He’s a phenomenal horse and I’m privileged to be his rider. Jacqueline Brooks, 44, of Cedar Valley, ON, performed the Grand Prix on Thursday, the opening day of Dressage competition at the Olympic Games. Riding D Niro, a 13-year-old grey Swedish Warmblood gelding owned by Brookhaven Dressage, Inc., Brooks earned a score of 68.526 percent. She finished in 41st position individually and will not advance to the Grand Prix Special. Brooks will go down in the history books, however, as the first athlete to ever wear a safety helmet instead of the traditional top hat in Olympic Dressage competition. Unfortunately, Canada’s other Olympic Team member for Dressage, David Marcus, 31, of Campbellville, ON, suffered disappointment when his mount, Capital, spooked and went off course in his Grand Prix test. Unable to regain his horse’s concentration in the middle of a heavy downpour, Marcus was eliminated. As the scores of all three team members count towards the team standings, Canada was also eliminated from the team competition. The Canadian Olympic Team for Dressage is supported by Chef d’Equipe Gina Smith; Veterinarian Dr. Geoff Vernon; Technical Leader Markus Gribbe; Team Manager Christine Peters and Personal Athlete Coach Robert Dover. Team alternate is Diane Creech. Grooms include Lindsay Kellock (Holzer); Eleanor Anne McFee (Brooks); Alexandra Reid (Marcus); and Christine Bacher (Creech). Kerri McGregor is the Team Leader for the Canadian Olympic Team for Equestrian and Tina Collins is Assistant Team Leader.